Our highly trained team of critical care specialists, or "intensivists," are present 24/7 at the hospital and ready to treat patients in need of immediate attention in the Emergency Department (ED), general medical surgical units and in the intensive care units (ICUs). In fact, a member of this efficient team arrives within five minutes of being called to any one of Montefiore's adult ICUs and within 30 minutes when called to another area of the hospital. "It is well established in the medical world that rapid access to critical care saves lives," notes Vladimir Kvetan, MD, Director of Critical Care Medicine at Montefiore Medical Center. "We took that premise and ran with it to a degree most other hospitals have not. As a result, we are saving lives and reducing medical complications and costs in caring for the critically ill."
Most hospitals practice "silo" ICU medicine, which Dr. Kvetan explains is a group of specialists practicing only within their own discipline during daytime hours in a specific unit. "Montefiore on the other hand, has an 'ICU Without Walls.' Our ICU specialists — many of whom are triple boarded — are cross-trained to provide care in all critical care disciplines," he elaborates. "They are available immediately, around the clock in any department of the hospital. For example, a 'medical care' ICU specialist can provide critical care in a surgical ICU recovery room or in the ED." In addition to providing rapid bedside response to various units in the hospital, our Critical Care Medicine Consult Service specialists also help maintain the emergency room and operating room and advise doctors and nurses providing care for all ventilator patients. Through its ongoing efforts to improve efficiency in its Critical Care Medical Department, Montefiore has significantly reduced mortality in its medical-surgical ICUs from since the mid-1980s. More recently, Montefiore has been named as one of the top hospitals providing exemplary critical care. Solucient, the nation's leading source of healthcare business intelligence chose Montefiore as one of the country's best ICUs, calling it a "benchmark" hospital and the Alliance for Quality Health Care listed Montefiore on its "honor role" of hospitals with superior care for critical care diagnoses. Additionally, a recent Leapfrog Group Report ranked Montefiore in the Top 10 Hospitals for patient safety and among the top one percent of all U.S. hospitals based on its strategic investments in sophisticated, integrated technology. This encompassed diagnostic and treatment equipment, as well as family-satisfaction-related video forms and Montefiore's family-centered website. Montefiore's Critical Care Medicine's clinical outcomes in coronary artery bypass graft surgery and craniotomy surgery are the best in New York State and New York City. 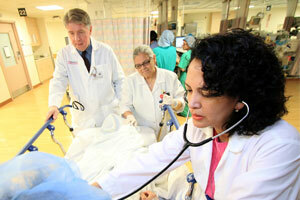 Safety and the highest quality care possible are core principles of the Division, along with excellence in education. As part of our mission, the Division places great emphasis on education. Our unique Physician Assistant Residency Program trains physician assistants to become highly skilled in treating acute and critically ill adult patients. Plus, the Critical Care Medicine Fellowship Program at Montefiore Medical Center and Albert Einstein College of Medicine has produced numerous winners of the esteemed Academic Fellows of the Year, and Critical Care Medicine faculty and fellowship program graduates have received multiple competitive Teacher of the Year Awards at various hospitals.